Belated musings on Veterans' Day got me thinking about this this photo I took in France a couple of years ago. 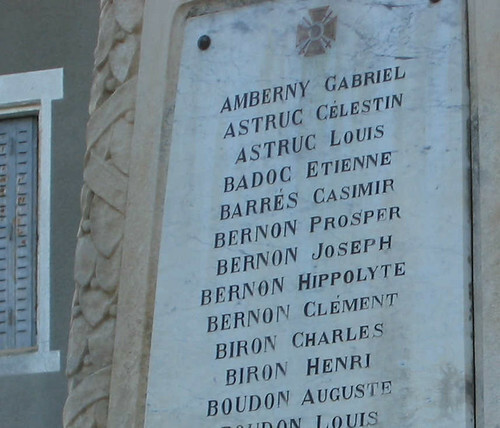 This memorial is in St. Germain-du-Teil, but there's one like it in every French town. St. Germain-du-Teil is a tiny village perched on a hillside in Languedoc-Roussillon, population today maybe a few hundred. I don't know if its population was much greater back in 1914. But look at that memorial: St. Germain-du-Teil very likely sacrificed every single one of its able-bodied sons to the First World War. Three Astrucs. Four fine young Bernon brothers or cousins. Two Birons, two Boudons. And that's just on the first face of the memorial. The second side runs to Radeille, and I think the S's and T's were on the third face. Almost every surname represented appears at least twice. Ninety years later, I'm sitting in the courtyard of St. Germain-du-Teil's only public house, drinking cassis vin blanc and chatting about interior decoration, divorce and estranged children, and life in rural southern France, with a guy a little younger than myself. He'd once lived and worked for a decorator in Paris and was now working as a roofer in the next village. He would have been the great-grandson--possibly the great-great grandson--of someone who fought in the First World War. We didn't discuss that. Those memorials are everywhere, and I doubt most people today really see them. I don't know if the displaced decorator was an Astruc or a Clavel or a Lacas. But he was French and therefore by definition a descendant of someone who lost more than one beloved young man to that war. What I'm pretty sure of is that a mere ninety years, a tiny century, can't have erased the effects of that degree of loss. The Kool-Aid was very strong back then, I guess.